Since late August of this year (2011) Children’s Hunger Relief Fund has been working towards our goal of distributing One Million Meals to starving children and their desperate families who are in great need and horrific circumstances. “We had a few scares and some real close calls.” Tells our Emergency Relief Team Leader who has been traveling in and out of the Somali Region for months now, desperately searching for a way to get as many meals to the starving people in the region who need it most. The need is great, but thanks to our CHRF Emergency Relief Team and our CHRF Donors we have achieved our goals of providing the children and their families with over 1,000,000 meals! 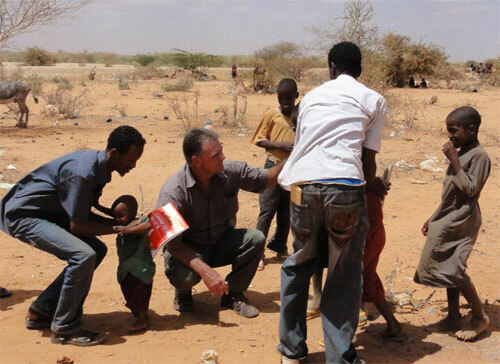 Now with our team going into the Somali Region again soon we will far surpass our goal and continue to help providing food for children and their families where NO OTHER relief Agencies have been able to help. For making these combined deliveries of over 1,000,000 meals possible, we THANK YOU! We thank all of our CHRF Donors for making these life saving trips possible! “Never before (over the past 15 years) have I faced so many challenges in trying to help feed starving people (as in the Horn of Africa region). This must rate as one of the most difficult situations I have worked in due to many factors, including Political Interference, new requirements being introduced almost daily restricting our movement, poor security with kidnappings and killings constantly taking place and increasing with each week, not to mention the situation of the poor and suffering. It has been two months of battling, doing everything possible to help these poor people, but being blocked at almost every turn. We were finally able to deliver meals but not nearly as much as is greatly needed. It is also difficult for Westerners (who are being targeted) in some of these places, with numerous Western aid workers, having been kidnapped. But in spite of numerous obstacles, I am happy to announce that we have managed to find an opening! Recently purchasing 100,000 pounds of food aid in the last 3 weeks, and we are delivering urgently needed meals to people that are not receiving aid from any other agencies. 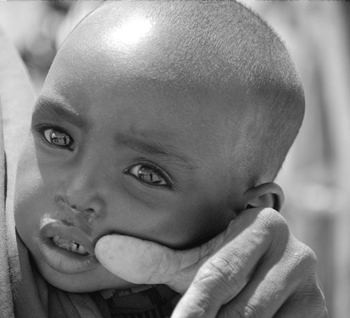 We are reaching out to both Ethiopians and Somali families who are suffering. 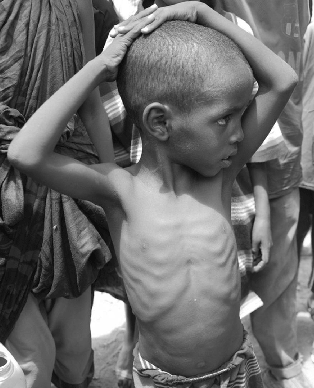 There are some 12 million people at risk across the region.” Recent reports from various news agencies and the United Nations indicate that 3.7 MILLION Somalis are “on the brink of starvation” with tens of thousands of people having already needlessly died because of the famine. On our next two trips we are planning to deliver 200,000 pounds of food, and another 100,000 pounds next month. The United Nations reports that "750,000 people could die in the next few months unless aid efforts are scaled up." “A combination of drought, war, restrictions on aid groups, and years of chaos, has pushed four million Somalis — more than half the population — into crisis.” Agricultural production is just a quarter of what it normally is, and food prices continue to soar. suffering because of this drought. 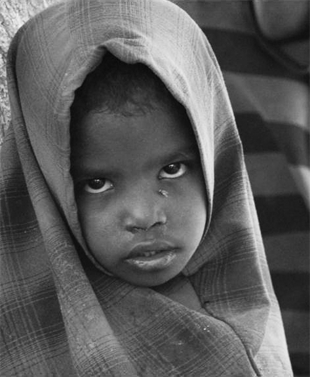 “Many thousands of children are struggling to stay alive in the Horn of Africa, many thousands have already died. But thanks to CHRF Donors and Supporters the lives of thousands of children may be saved!” -CHRF International Crisis Relief Director. 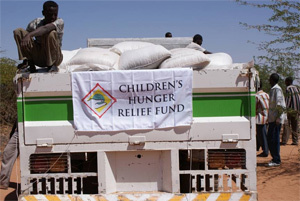 CHRF emergency team and our partners on the ground will be busy delivering well over 100s of tons of food aid to the suffering children and their families. There is a lot of red tape and difficulties that we are busy trying to overcome, but we will do whatever it takes to save lives of these children. It's only because of the recent donations that have come in from our generous and supportive donors that have made this even possible. So many hungry children and their families will be incredibly grateful." It’s because of donors like YOU that CHRF is able to send such amazing support to the children that are in great need. Thank You for taking a personal interest in helping the lives of others who are in desperate need. Thank You for making a difference in the lives of so many. 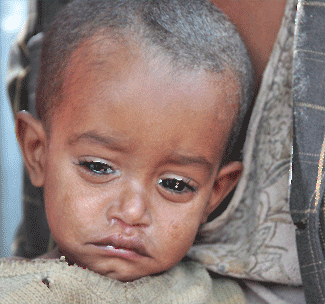 “Many times the difference between life and death for these children can be a meal. Good Samaritans like the CHRF Donors help provide those meals. The difference between life and death for these children can be the click of a button, a signature on a check or the swipe of a plastic credit card. The difference between life and death for these children can often times be You or Me and many times we don’t even know it. Thank You for your support!” - CHRF International Crisis Relief Director. URGENT & IMMEDIATE HELP NEEDED! CHILDREN ARE DYING AT AN ALARMING RATE! Members of our Somalia Relief Team visited the area last week to access the needs and find new ways to deliver food and other aid to the Somalia Refugees. We are currently preparing to deliver more than 20 tons (40,000 pounds) of food to the refugees and are now busy with the logistics of purchasing the food aid for delivery and distribution in this region. The situation is getting worse in Ethiopia as well with over 300 000 cattle dying in the South. The United Nations relief chief visited the capital of Somalia today, stressing that aid workers must have safe passage to those in need so they can save the lives of millions of people at risk from malnutrition or infectious diseases as famine grips the Horn of Africa. On a one-day visit to Mogadishu, Under-Secretary-General for Humanitarian Affairs Valerie Amos toured Banadir Hospital – one of just four locations in the war-wracked city where children suffering from acute malnutrition are being treated. Ms. Amos described the scenes she witnessed in the hospital as heartbreaking. “The children are so weak they can't lift their heads, while their mothers are in despair,” she said. As many as 3.2 million people are estimated to be on the brink of starvation in Somalia, where persistent drought and ongoing conflict have led to famine being recently declared by the UN in five regions in the south of the country, including the area in and around Mogadishu. The situation is compounded by a deadly outbreak of cholera, while the number of cases of acute watery diarrhoea has also spiked in the past two months. The UN Office for the Coordination of Humanitarian Affairs (OCHA), which Ms. Amos heads, has warned that the famine is likely to get worse in the coming weeks. 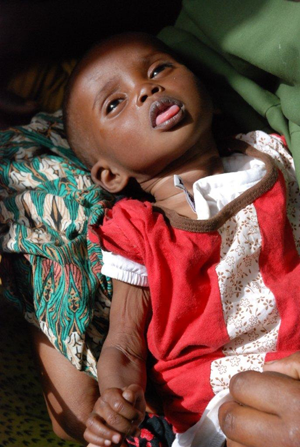 The number of acutely malnourished children in Somalia, currently at 390,000, could double within the next year. 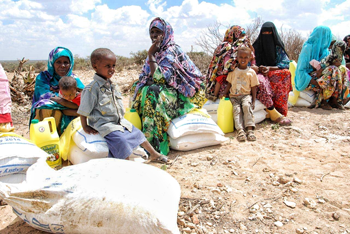 While Somalia is the worst affected country, neighbouring Kenya, Ethiopia and Djibouti are also suffering. More than 12 million people across the Horn of Africa now face severe food shortages and require international assistance. During her visit to Mogadishu, Ms. Amos – who is also the UN's Emergency Relief Coordinator – met with representatives of the Transitional Federal Government (TFG), UN staff and aid workers with non-governmental organizations (NGOs). She emphasized for the need for more safety and security for residents of Mogadishu, whose population has been swollen in recent weeks by the arrival of at least 100,000 internally displaced persons (IDPs) fleeing other famine-stricken areas. For most of us it’s impossible to imagine being forced to flee your house, your job and all of your possessions behind in order to escape to safety with your family. But before you can reach a place of safety you must pass hundreds of miles of dessert full of gangs and rapists. All of this must be faced on foot since you are without any other transportation. You have no food since everything was left behind at your house and there is no government who cares enough to provide for you or the thousands of starving families around you. There are no police to keep things under control. 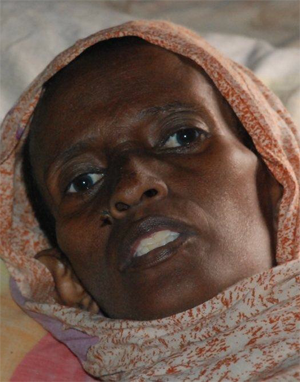 In one second your life can turn upside down, going from a normal home life to absolute hell, just as it did for hundreds of thousands of people who were living in Somalia. To most people, especially in the United States, the term “refugee” will never be anything more than a character in a story or a concept they learn in history class or on the news. But for hundreds of thousands of children and their families in Somalia that have been forced to abandon their homes and lives because of endless civil war and famine, the term refugee has never felt so real. By the same token, a drought in the United States simply translates to an inconvenience for most people. In Africa, a drought is a matter of life and death. 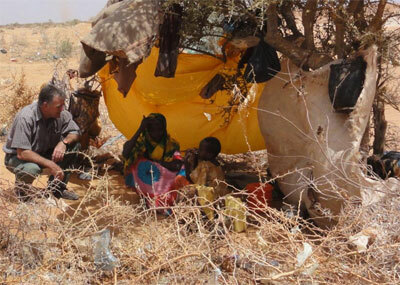 The fighting in Somalia has caused hundreds of thousands of people to flee to the west towards Ethiopia. But with hundreds of miles of dessert between the two countries and no established refugee camps along the way, the situation has turned into chaos. The people and children, who are completely dependent on relief agencies for food, are trapped in a literal “No Man’s Land”. These refugee areas have broken out into a state of lawlessness with no police or military to watch over, protect or even care about the situation and people. Again, because everyone has been forced to leave their homes and lives behind they have almost no way of providing even a scrap of food for their children without the help of relief agencies. 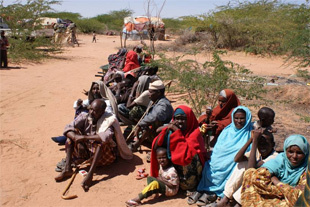 But not only are these people plagued by war, Somalia is currently going through the worst drought in over sixty years! Thankfully Children’s Hunger Relief Fund, with the support of our Donors, is now one of the few agencies delivering food and aid to these lost and forgotten people. We must find out more about this area, the people, their needs and the solutions. 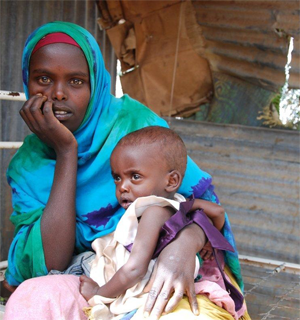 This is 17 year old Johar with Khadra her 1 year old daughter who weighs 13lbs, this child is severely malnourished. (her head was out of proportion to her body). 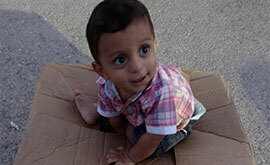 This child is in very poor health and needs urgent help. 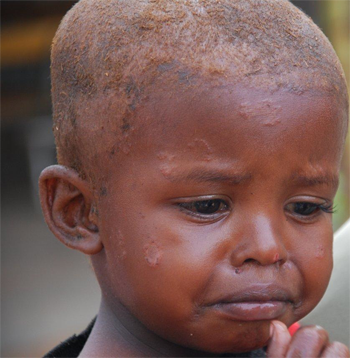 Please join us in our effort to raise funds in order to continue sending and delivering life saving aid to the lost and forgotten children that have no home. 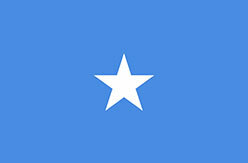 Its almost impossible to deliver aid into Somalia, one of the more remote and dangerous regions of the world, most non governmental organizations (NGO's) have left due to the insecurity. The United Nations have had 8 of its staffers and 24 aid workers killed this year. 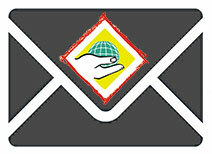 Convoys of food aid are attacked and hi jacked while aid workers face kidnapping or death. There are more than 200,000 people crowded into the world's biggest refugee camp, at Dadaab with some 5,000 new refugees arriving each month. Refugees are also fleeing into Ethiopia, Djibouti and Kenya. Somalia's main export is terrorism with a number of key figures and groups having free reign in this region. Al-Shabaab (Arabic for Youth) now controls much of the south of the country, similar to the Taliban: recently, 1,000 spectators gathered at a sports stadium in the port of Kismayo to watch al-Shabaab stone to death a 13-year-old girl, Aisha Ibrahim Duhulow. Amnesty International says al-Shabaab arrested her and convicted her of adultery after she complained she had been gang-raped. Al-Shabaab is taking its terrorism to new territories. On Oct. 29, members detonated five car and suicide bombs outside U.N., Ethiopian government and local administration buildings in the northern regions killing more than 30 people. 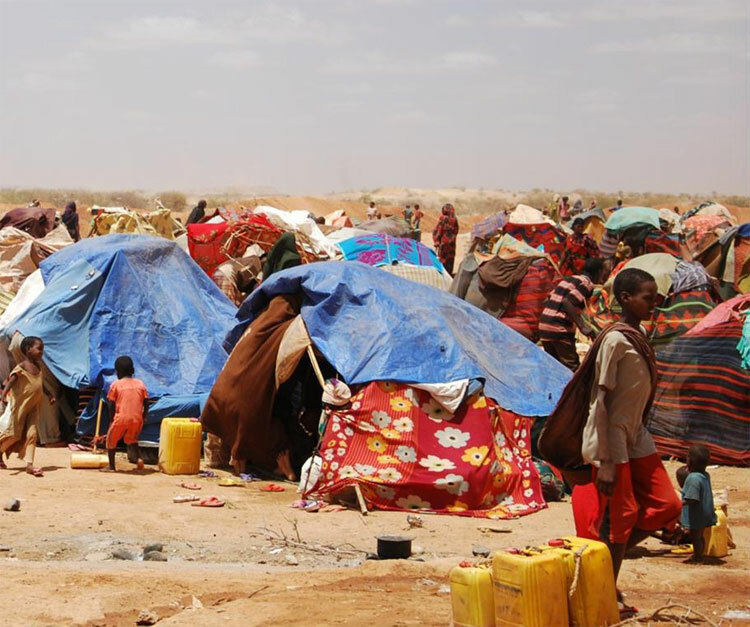 The Horn of Africa is volatile and dangerous making it difficult for aid workers to help those suffering from famine, drought, war and disease. In spite of difficulties and endless challenges: our workers being detained for hours, harrassed, endless roadblocks, guns pointed & threatened our team managed to successfully deliver and distribute 70,000 meals of food aid to 500 internally displaced families seeking refuge in Northern Somalia.